U.S. shipments of residential gas storage water heaters for June 2017 increased 0.3 percent to 362,619 units, up from 361,674 units shipped in June 2016. Residential electric storage water heater shipments decreased 3.5 percent in June 2017 to 334,234 units, down from 346,193 units shipped in June 2016. 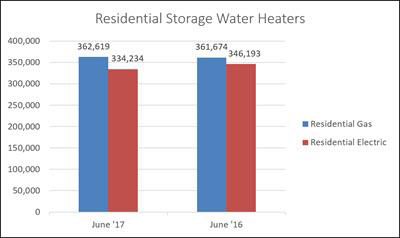 For the year-to-date, U.S. shipments of residential gas storage water heaters increased 3.6 percent to 2,231,051, compared to 2,152,855 shipped during that same period in 2016. Residential electric storage water heater shipments increased 4.0 percent year-to-date to 2,091,748 units, compared to 2,012,123 shipped during the same period in 2016. Commercial gas storage water heater shipments increased 2.1 percent in June 2017 to 8,555 units, up from 8,377 units shipped in June 2016. 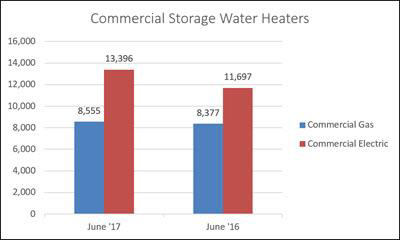 Commercial electric storage water heater shipments increased 14.5 percent in June 2017 to 13,396 units, up from 11,697 units shipped in June 2016. Year-to-date U.S. shipments of commercial gas storage water heaters decreased 2.0 percent to 50,255 units, compared with 51,302 units shipped during the same period in 2016. Year-to-date commercial electric storage water heater shipments increased 17.4 percent to 71,948 units, up from 61,279 units shipped during the same period in 2016. 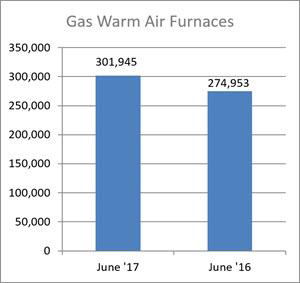 U.S. shipments of gas warm air furnaces for June 2017 increased 9.8 percent to 301,945 units, up from 274,953 units shipped in June 2016. 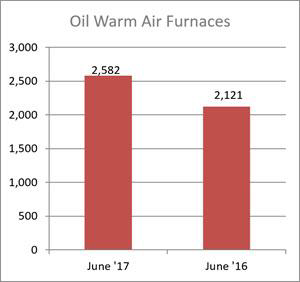 Oil warm air furnace shipments increased 21.7 percent to 2,582 units in June 2017, up from 2,121 units shipped in June 2016. Year-to-date U.S. shipments of gas warm air furnaces increased 9.9 percent to 1,417,209 units, compared with 1,289,146 units shipped during the same period in 2016. Year-to-date U.S. shipments of oil warm air furnaces decreased 1.2 percent to 13,016 units, compared with 13,171 units shipped during the same period in 2016. 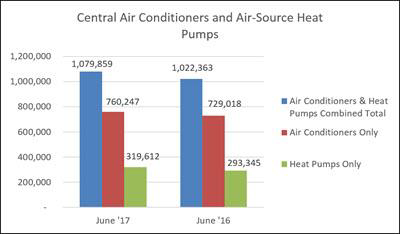 U.S. shipments of central air conditioners and air-source heat pumps totaled 1,079,859 units in June 2017, up 5.6 percent from 1,022,363 units shipped in June 2016. U.S. shipments of air conditioners increased 4.3 percent to 760,247 units, up from 729,018 units shipped in June 2016. U.S. shipments of air-source heat pumps increased 9.0 percent to 319,612 units, up from 293,345 units shipped in June 2016. Year-to-date combined shipments of central air conditioners and air-source heat pumps increased 9.5 percent to 4,386,345, up from 3,989,465 units shipped in June 2016. Year-to-date shipments of central air conditioners increased 9.3 percent to 2,932,294 units, up from 2,681,694 units shipped during the same period in 2016. The year-to-date total for heat pump shipments increased 11.2 percent to 1,454,051 units, up from 1,307,771 units shipped during the same period in 2016.